Girlfriend, are you a creature of habit? I know that I am! Breakfast and my Bible reading occur together every morning. Protein is included with every meal. Cycling my stationary bike for 30 minutes happens at some point every evening, regardless of the amount of physical activity that occurred earlier in the day. My electronic devices are all recharged in the same area and can all be found plugged in for juicing at about the same time of the day. My makeup bag gets unpacked and repacked in the same exact manner every morning ~~ and is even placed in the same exact spot after use. I will even go so far as to say that I get dressed in the same exact pattern (from bottom to top) every time. Yup, I am a creature of habit. People like me get their feathers all ruffled when our things are moved without our permission, when the agenda of daily activities must abruptly add, delete, or delay tasks, when the expectation of a person or an event fails to occur ~~ we get flustered. This is not to say people like me cannot adjust ~~ because we do ~~ some of us have had to learn (the hard way) to be flexible. But we really do treasure our comfy spot in our habits. Can I get a Girlfriend to throw me a high five here? Our Scripture verse above is in the Amplified translation. Did you notice that the word habitually occurs three times? If you’re a teacher or educator or trainer of any discipline, you already know the teaching principle of “three’s a charm.” Basically, this principle says that the learner will be able to grasp or understand a concept in three deliveries. The first occurrence of the word habitually is in reference to keeping focused on God’s precepts and obeying the teaching of His commandments. 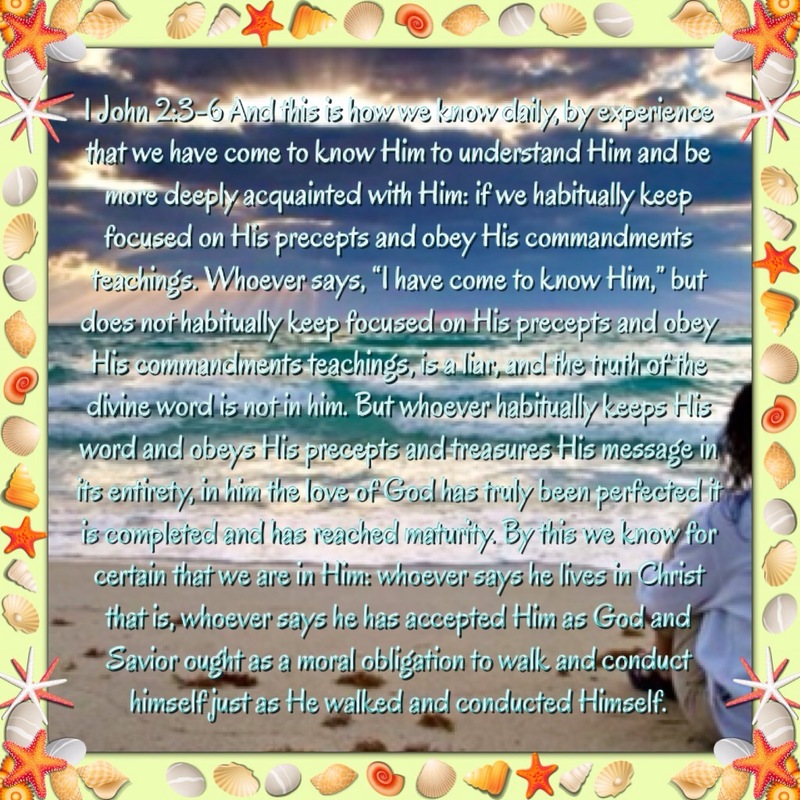 Now if I analyze the amount of energy exerted in accomplishing my daily tasks and put it to “use” in keeping focused on what God has taught me through His Word, I have a whole different understanding of “how” I am required to be focused and “how” I am required to obey His teachings. Words like diligence and concentrated immediately come to mind. The second occurrence of the word habitually takes that previous thought further and challenges the one who purports to “claim” that they are a Jesus Follower and says it is now a “benchmark” for determining where you truly stand with Jesus. Words like truth and genuine come to mind. The third occurrence of the word habitually wraps it all up and declares that the one who keeps, obeys, and treasures the Word of God ~~ he is the one in whom God dwells ~~ and his life will demonstrate this. In light of how much time and effort and energy I devote to getting my menial tasks done, I am forced to take a step back and make a few adjustments in my life so that it reflects the One to Whom I belong. Suddenly my daily habits must be reprioritized. What truly matters is my response to what God has told me to do. No other activity should capture more attention or zeal or enthusiasm or energy as my habit for God and His Kingdom. This is not an excuse to become sloppy or negligent in all the other facets of my life. But it does cause me to consciously and habitually think about how I am to live. Let’s make whatever necessary changes ~~ today ~~ and commit to habitually being found faithful in Him.